Viewed against the backdrop of Assyrian supremacy, the Scythian invasion, and independent power struggles preceding the emergence of the neo-Babylonian empire, Habakkuk and Zephaniah are two of the most difficult books in the prophetic canon.Cyril J. Barber explores these two much-neglected portions of Scripture in an effort to explain the purpose of each. 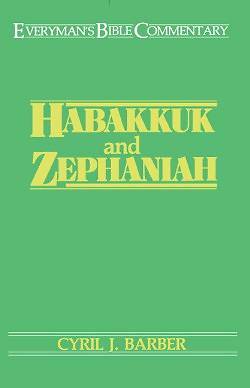 He examines first Habakkuk's teachings on injustice and suffering. Then he discusses Zephaniah's emphasis on the kingdom of God, noting God's plan regarding sin, judgment, and the salvation of His people. Detailed outlines and verse-by-verse commentary make this volume helpful to scholars and laymen alike who wish to discover the truths found in the minor prophets and to apply their age-old teachings to life in the twentieth century.